Heath Ledger in "The Imaginarium of Dr. Parnassus"
"The Imaginarium of Dr. Parnassus" is a fantastical battle between Good and Evil, with the souls of unsuspecting mortals serving as both pawns and prize -- and for fans of director Terry Gilliam, it's a heartening recovery from the misstep of "The Brothers Grimm." The film opens with the 1,000-year-old Dr. Parnassus (Christopher Plummer) and his troupe of players having fallen on hard times. Making matters worse is the arrival of the Devil, aka Mr. Nick (Tom Waits), who has come to collect on a bargain he made with Parnassus many ages ago. One dark and stormy night (naturally), Parnassus, et al., happen upon Tony Shepherd (Heath Ledger) in a highly compromised state. 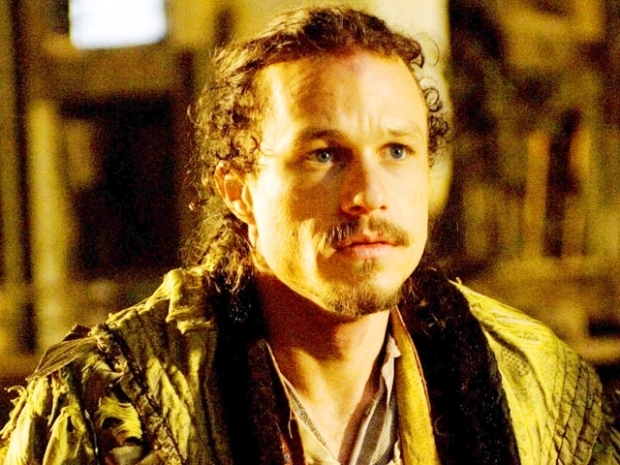 Considering Ledger's untimely demise, the condition in which we first see him is jarring, to say the least. 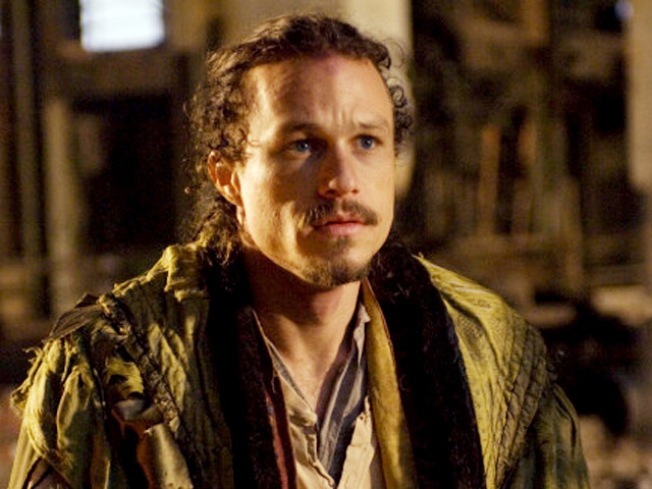 Ledger died of an overdose in 2008, having only completed about two-thirds of the film. After the derailment of his "Don Quixote" movie, Gilliam likely would have done anything to see this project through. It’s a testament to both Ledger and Gilliam that Colin Farrell, Johnny Depp and Jude Law all signed on to fill the void left by the late actor. It can be hard enough getting that kind of talent and star power to lead a film, much less play second-, third- and fourth-string. The four actors together create a character who progresses almost seamlessly from mysterious stranger to handsome savior to slippery conman. What could have felt like a gimmicky or unfortunate attempt to salvage the project comes off rather smoothly, with Dr. Parnassus' power to let people live their imaginations and Gilliam's strengths as a storyteller making it all work. Tom Waits is great as Mr. Nick. There are few personalities so singular, so arch in American culture as Waits. There's just no pretending he's not Tom Waits. And yet he manages to craft a new spin on himself, with all of his carnival barker's charm to the role, without grumbling and growling his way into a caricature of himself. At the center of the tug of war between Mr. Nick and Dr. Parnassus is the latter's daughter, Valentina, played by supermodel Lily Cole, who was born to star in a Terry Gilliam film. At nearly 5-11, with long, red hair and a Kewpie-doll face, she looks like something out of a fairy tale. Cole has been very open about feeling out her depth among talents like Plummer, Ledger, Depp … but her performance stands up. She convincingly plays the beautiful, flirtatious young girl longing for more of the world. Andrew Garfield, who won a BAFTA (a British Oscar) in 2007 for his work in "Boy A," gives maybe the best performance in the film as the fellow player who pines longingly for Valentina and is immediately suspicious of Tony. Director Terry Gilliam talks about working with the late Heath Ledger on "The Imaginarium Of Doctor Parnassus," how he found out about Heath's death, and calling upon Heath's closest friends to help finish the film. "Parnassus" most resembles Gilliam's early masterpiece "Time Bandits," both visually and thematically: the yearning for home and wealth, the symbiotic relationship between God and Satan, etc … As is his custom, Gilliam very nearly loses the plot towards the end (right around the time Peter Stormare shows up in a wheelchair for a role too small for even him). But he comes back to us just in time to salvage the film. Filled with dwarfs, bums, monsters, shattered mirrors, bottomless voids, trippy colors, the odd explosion and all manner of surreal landscapes that would make Salvador Dali dance like a little girl, "Parnassus" is vintage Gilliam.